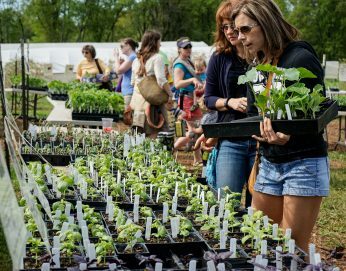 There are so many reasons why buying your garden seedlings at Crabtree Farms is different (we say ‘better’) than getting them from one of the big box stores. We choose plant varieties for our particular growing conditions. Chattanooga has a unique set of environmental factors that affect our garden plants. Our springs come early and so do summers. Summers are characterized by intense heat, sunlight, and humidity, and we tend to get a lot of rain over the season. All these factors mean that our region of the south experiences intense pest and disease pressure – so our plants have to be flexible and hardy. Most winters are mild, but if you live at the top of a nearby mountain, you may have many frost/freeze nights. Additionally, our soils tend to be clayey and, geographically, we are on the cusp of several different types of growing zone. So, while you may find tomatoes and squash at a big box store – they are being distributed regionally to nationally with little attention paid to local climatic variation and how that relates to which variety of tomato or squash will thrive in your garden. We focus on heirloom varieties. You won’t find any GMO products or varieties here. You may find a hybrid tomato, but that’s not the same thing. To make a ‘hybrid’ tomato you manually collect the pollen from the male flowers of one variety, let’s say Brandywines. Then you essentially tickle all the female flowers of a different variety, let’s say Better Boy. Those female flowers make a tomato, you save the seeds and name your new hybrid the Better Brandy. Humans have been making hybrids this way since before the time of Mendel. We love heirloom varieties and are excited to share them with you! Mike and Andy, our Greenhouse ‘Masterminds’, also take special delight in offering a wide and eclectic range of specialty herbs. This goes far beyond the standard mint, basil, and thyme you’ll find in other stores. Not only can you not find this breadth and depth of garden starts at the big box stores, our plants weren’t trucked in from a far-off commercial greenhouse. We start our plants by hand here at the farm. We all know food made with love is better. Plants grown with love are better, too; they receive ridiculous amounts of attention and care. It also means that when you come to buy your plants you get to talk to the experts. Mike and Andy (aforementioned Masterminds) and their crew of talented and nerdy greenhouse volunteers spend all day each day of the sale talking to you, the curious customer. They advise, encourage, and explain so that you can make the best decisions for yourself. You just don’t find this level of expertise and knowledge in the anonymous ‘garden’ section of a big store.